I've been looking online for a vacuum line diagram for my 1973 351C 2 bbl. The engine is all stock. I think I may have found the right one or two diagrams, but some of the hookup locations are so vaguely drawn I'm not sure where every line goes. Right now the car has no lines coming off the 3-prong vacuum line control valve. Every diagram that contains that piece shows at least 2 lines coming from it. Of the 2 lines coming off the distributor's vacuum advance unit, the line closest to the distributor goes to the intake manifold, and the line that's further away from the distributor goes to the carburetor. As I am used to air-cooled VWs, I don't know why this car has so many damn vacuum lines, but I suspect that's what is there is not right, as most diagrams for the 351C show at least 2 lines coming from the 3 prong vacuum line control valve, and my car has none. Is there a definitive answer as to how these lines should be run? The car, having all of 170 hp new, and 100k miles on it now, is not gonna be a screamer, but I want it to run the best it can. Did you look at these, no guarantee that they are any better, but maybe more to look at. Yeah, air cooled VWs didn't have vacuum advance on the distributors, and that's part of the reason ours have so many vacuum lines, plus EGR and ram air, really adds up. I have a 71. The 3 port vacuum switch in theory routes different vacuum sources to the distributes based on engine temperature. I can not help with your year as it has much more vacuum demands like EGR for one. Years ago (like ten) I purchase a vacuum diagram book for my year from a mustang parts house. Unfortunately much different so not much help. Here's the 73 351-2V vacuum diagram. Every time I look at this diagram for a 73 351C 2v, there two things that don't add up to me. 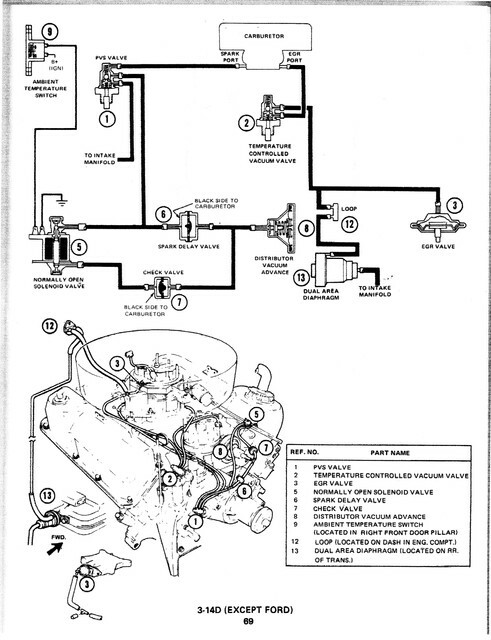 Every 73 Mustang 351C with an automatic (and 302 for that matter) I have seen have a 4 port vacuum loop on the firewall, not a 2 port as shown in the diagram Second I have never seen a single 73 car with a ambient temperature switch on the door pillar or the related selenoid. Did all 351C 2v have these and they were just removed over time? Maybe that's a diagram for California vehicles? The booklet doesn't say anything about California. There's another that's listed for the Mustang & Cougar, but it has the speed sensor and amplifier. That's another setupI've never seen myself. It's a reference, so one can just eliminate whatever extraneous info is there that you don't need. Heck, I'd pitch the whole EGR setup. I'll agree that all the firewall vacuum trees were four port. (08-10-2018, 07:55 PM)rackerm Wrote: Every time I look at this diagram for a 73 351C 2v, there two things that don't add up to me. 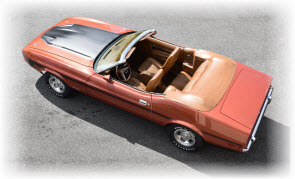 Every 73 Mustang 351C with an automatic (and 302 for that matter) I have seen have a 4 port vacuum loop on the firewall, not a 2 port as shown in the diagram Second I have never seen a single 73 car with a ambient temperature switch on the door pillar or the related selenoid. Did all 351C 2v have these and they were just removed over time? I noticed that, too. Also, my vacuum advance has two ports but both protrude from the side, whereas every other one I have seen has one protruding from the top. So today I cleaned up and remarked the timing marks on the harmonic balancer only to find the timing at idle to be about 22d btdc. My car has (non-functioning) AC. Getting to the distributor bolt proved to be impossible. Absolutely nothing I have will fit in there and sit flush on the bolt - socket, open wrench, box wrench, nothing. So next chance I get I will bring one of my 1/2" combo wrenches to a muffler shop and ask someone to heat it at the closed end and bend it to about a 60d angle. That should enable me to get the closed end on the bolt and have some room to turn it. Oh, and btw, air cooled VWs do have vacuum advance distributors. It's just that many of them over the years had been replaced with cheaper '009' mechanical advance-only distributors, as mine had when I got it. It now has an OEM Bosch vacuum advance distributor in it.